Its first time out. It weighs 1280 without fuel. Tires are 205/50-15 RE11 Bridgestone Potenzas. I am assuming that I should crank the shocks way up as well. Look carefully at your tires before your runs and after the first runs. You should be able to see how far towards the sidewall they are scuffing. You can adjust your shocks to help with over/under steer on transitions. Making the front or rear stiffer( shcoks ) will make that end carry more weight while it transitions. Have great luck it should be a lot of fun! For the older among us , slow and steady can win the race if you don't spin, don't get lost and don't nab cones! 25 sounds a little high for those tires, but wheel width makes a difference too. Probably a good place to start, though. Hopefully you'll have enough runs to find what's fastest. As far as the shocks go, I would definitely crank the fronts way up. 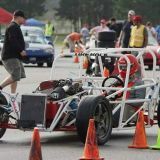 In my car, which has mild understeer at anything over 30 mph, I could not keep the back end in line during tight transitions at autocross. Use chalk on the side wall to see how far the tire is rolling over. I run 18f 20r. I would second Graham's numbers as a probable and reasonable starting point. Chalk as well. It is somewhat counter-intuitive, but you will most likely want to raise your pressures in the rain. The curved surface of slight over inflation will generally benefit water dispersal. Different make tires but the same size. Nittos vs Bridgestones I would think is pretty damn close. Had my front end aligned by a local race shop. After the main guy drove the car he recommended the same as Graham, 18 front, 20 rear. Haven't pushed at those pressures but it does feel better over the 26 I had in them. Good luck, have fun, and post your experiences please. My car is 1100 lbs wet. I run 18lbs front and rear. I might try running the front lower to try and get more heat into the tires. I would use caution in "cranking" your dampeners or any other adjustments. Make smaller changes and make 1 change at a time to hone in the balance of your car. I agree with what everyone has said. High to mid teens is probably optimal. Typically less pressure will increase grip at the cost of increased tire wear especially on the edges, just make sure you chalk/mark the tires and are not rolling onto the walls. Most performance street tires have little arrows marking optimal contact patch, which is wear you want the chalk to wear off. I nearly always run a little softer in the rear usually around 2 PSI less. When it rains you should add a little pressure to reduce the contact patch as mentioned.